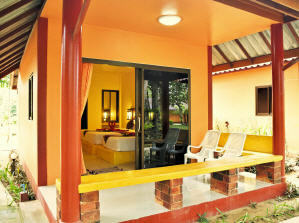 Our contemporary Thai-Style Air-Con Bungalows offer you a peaceful luxury inside our beautiful wild garden. They are only available with a double bed. Each bungalow has its own private balcony with a hammock, western-standard bathroom with hot shower, TV, refrigerator and remote controlled air-con. 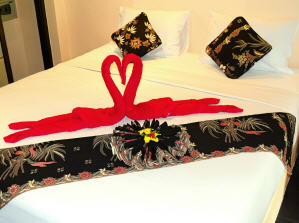 Furnishings and fittings are handmade from traditional local materials on the island. 30m2 including balcony.